I’ve been wearing saris avidly for the past 6-7 years. Before that, I’d wear this 6-yards of unstitched garment once in a while, for the thrill of standing out amongst a sea of business suits or because that’s what the dress code (of the formal military parties) demanded. And it was always a tussle to rig-up this garment, do the pleats, and make sure that I didn’t trip on a bit of sari that hadn’t been tucked-up to the right length. Fumble. Stumble. Bumble. Three little words that captured the essence of my sari wearing efforts. But how and when this transformation happened...this change from viewing the sari as a costume to be rigged up occasionally to loving it for its fluidity and grace, and wearing it as often as I could, still leaves me a bit hazy around the edges. So, what is it that I love so much about the sari? What is it that’s getting urban Indian women to open their sari closets just when the dust was beginning to settle in? What is it about this unstitched garment that’s slipping a hint of romance back into everyday dressing? 1. The sari makes you feel like a queen, even on an ordinary day, in an ordinary life situation. You may be in a pastel chiffon or in a breezy cotton sari, walking to work / having coffee with a friend / sitting in your home office working on another deadline / picking up your child from school – but just this ream of fabric can make you feel regal & beautiful. Strange as it may sound, but it does help you see the beauty in your day, the beauty in yourself. 2. The sari stands out. Sometimes, not in a very positive way, especially if you’re amidst a group of people who believe that a pair of pants is more modern, more stylish than a sari (I’ve heard plenty of comments in that genre). But it also stands out in a good way, especially now, when urban Indian women are re-discovering their saris. Choosing to wear a sari sets you apart. 3. Sari-wearing gets better with time. The more you wear it, the more comfortable it gets on your skin. The more you love it. The more you reach for it. With every sari you wear, your confidence in dressing up in the garment grows. It begins to show in the way you stand tall, the way you walk, the way you carry yourself and that sari you’re wearing. It also shows in the way you accessorize it, the confidence with which you style it. 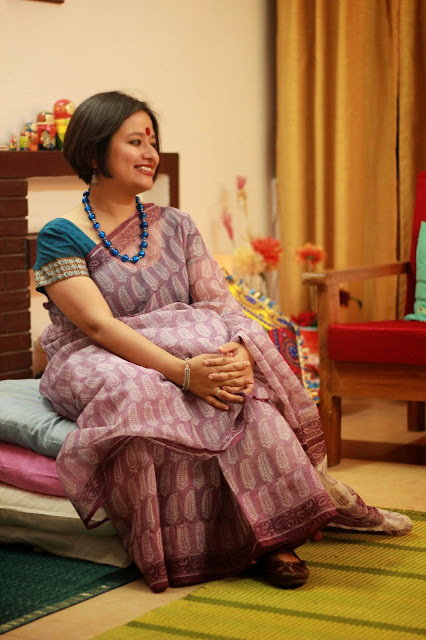 This is what I like about it the most – the ongoing banter with style and the sari. 4. The sari is a good conversation starter. 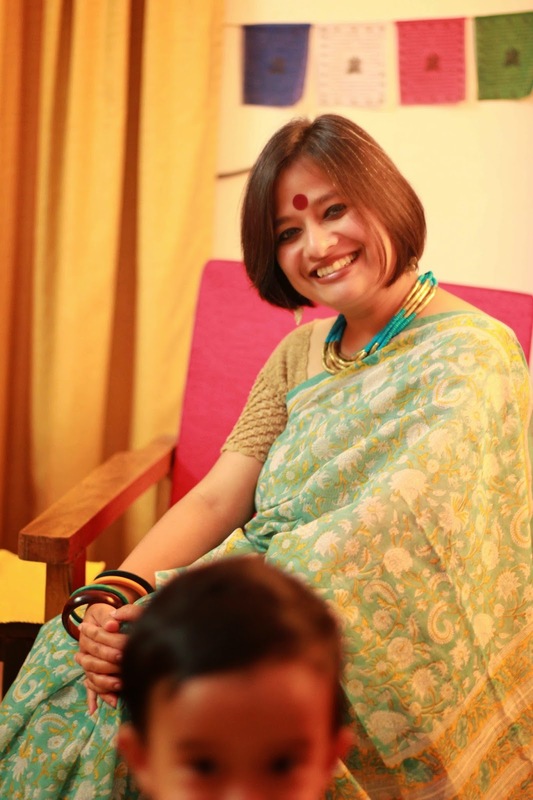 Almost every time I wear a sari, it sparks off a conversation. Often about the sari I’m wearing, and sometimes about why I’m wearing a sari when a pair of pants could have been an easier option. But almost always, a sari will start off a conversation. 5. There is so much beauty, and so much choice in a sari. I still can’t understand when people complain about the sari, saying it’s boring and that it lacks variety when it comes to style. If there’s one thing it’s not, thats boring. Every handloom sari on this planet is different. The fabric of each sari is different, so is the color, texture, story, weave. You can wear it in different ways or style it differently. There’s an abundance of choice right there in your sari closet. And so much beauty. Honestly, there’s no other piece of clothing I find more beautiful than 6 yards of story, woven one thread at a time on a loom. 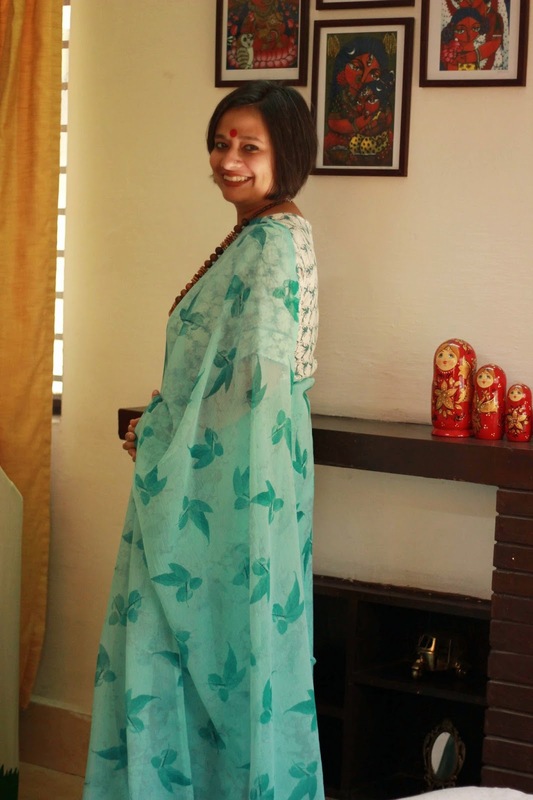 The sari is more than a garment; it’s a craft, and it’s a piece of history. 6. You can never go wrong or look ‘wrong’ in a sari. Whatever be the occasion – formal parties, office meetings, work-at-home deadlines, dinners out or a trip to the mall – you can wear a sari without an apology, without thinking if you’re in the right attire. In the same breath, you can’t go wrong with your look in a sari. You don’t have to worry about sucking in your tummy or checking if the buttons of the shirt aren’t popping out. You don’t have to worry if you’re slim enough or too chubby for a sari. You’re always just right for the sari. 7. The sari’s gentle on you. 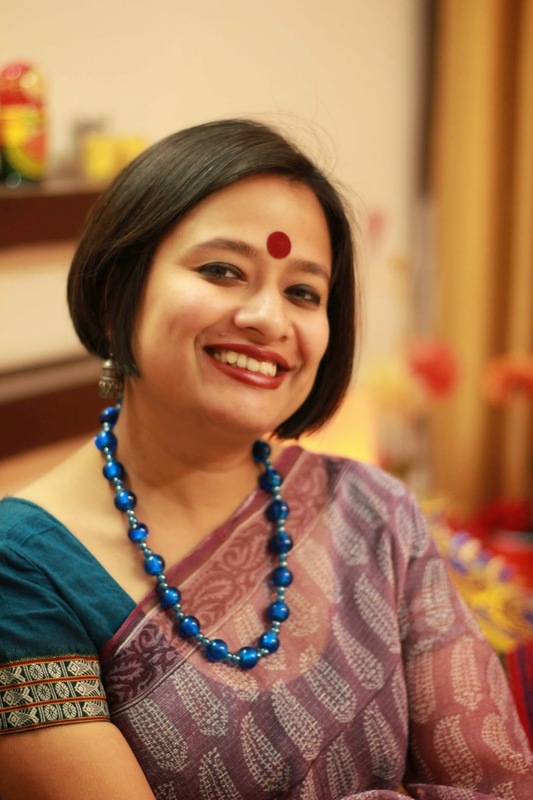 It’s forgiving in many ways (you may not like to wear a sari, but it’ll still make you look good when you wear one; it hides your physical imperfections - or what you perceive as imperfections). It makes you more forgiving of yourself. It makes you feel good whenever you wear a sari. And, believe it or not, it often brings out the best in you. What do you love about the sari? Drop in for some sari banter at my Facebook page. You look so beautiful and graceful. 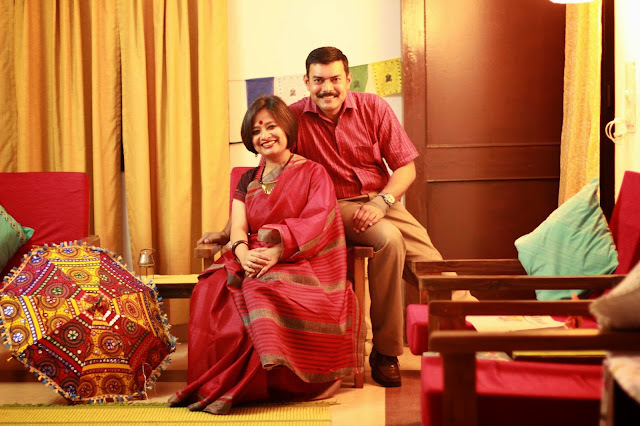 Love the way you dress up your sarees :) I stumbled upon your page while googling pixe cut + saree. I have a pixie (real short) and I have worn sarees a couple of times and i thought I looked nice. My parents, on the other hand, jut dont like it and say I'll not look good in the south indian kanchipuram silk saree look with big jhumkas. I need to be dressed very traditionally for an upcoming wedding and they want me to grow out my hair, huh! I cant and I dont want to. I just need some confidence and inspiration about the kind of saree draping and how to choose big jhumkas (never worn anything long or huge since my pixie). I am a kind of person who likes to be carefree and fuss-free when it comes to saree. I need it tucked in or pinned in all possible places so that I can go about my business. I still dont understand how to carry off a floating pallu style. Would be great to get any suggestions, advice or tips from you :) Thank you.